We live in a drive through fast food, need our information now society. 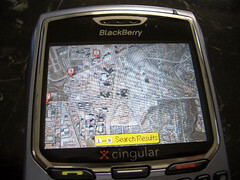 To help with finding this so called information, mainly just confirming useless trivia at parties, I have been carrying Google on my hip since the original black and white T-Mobile Sidekick was released, but have since moved onto SMS and Treo Blazer browser access of their increasingly mobile driven applications. Text driving directions were OK on these platforms, but Google has outdone themselves with this BlackBerry application (no browser used here folks) that attaches via your data plan to the Google Map and Satellite databases to stream imagery to the phone in real time. My favorite additions are the "push pin" search results and the extremely fast updates via the EDGE data network. Get your Finnish, Asian or Motorola J2ME flip phone or Blackberry nearly as smart as your GPS by heading to google.com/glm online. As per Verizon's stranglehold on BREW, those subscribers are going to have to live without this software or service.